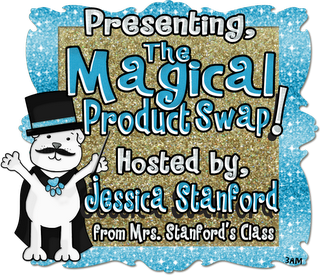 I also linked up with Mrs. Stanford's Class for The Magical Product Swap! I swapped with Mrs. I's Class. 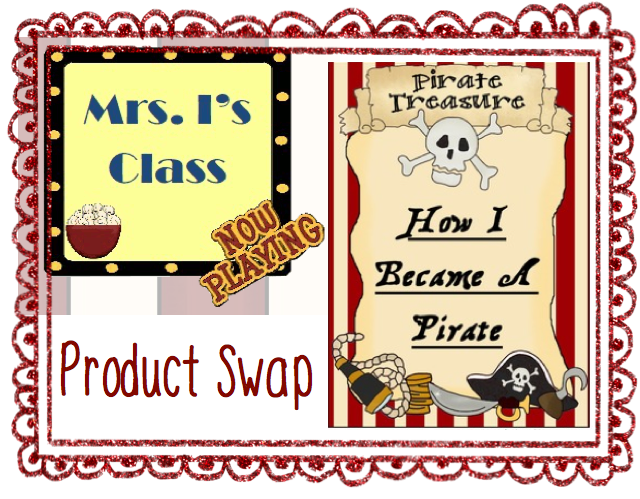 I chose her "How I became a Pirate" take-home packet. One thing that I wanted to try was to print all of it in black and white. There has been a lot of discussion on the availablilty of ink cartridges. In my school, we are encouraged to print in black and white. So, I tried it. As you can tell, this product looks fabulous printed in black and white and mounted in colored cardstock. Almost all school districts are now using Common Core standards. This product is Common Core aligned. Mrs. 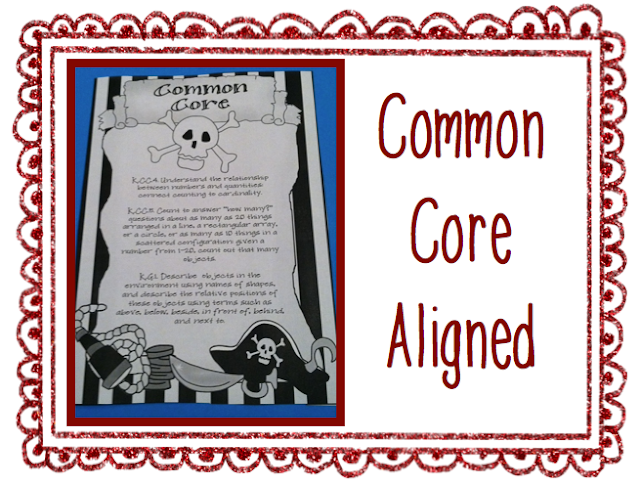 I. has written the Common Core standards in an easy to read format for reference and instruction. This is very useful when creating lesson plans. * K.CC.4. Understand the relationship between numbers and quantities; connect counting to cardinality. * K.CC.5. Count to answer “how many?” questions about as many as 20 things arranged in a line, a rectangular array, or a circle, or as many as 10 things in a scattered configuration; given a number from 1–20, count out that many objects. * K.G.1. Describe objects in the environment using names of shapes, and describe the relative positions of these objects using terms such as above, below, beside, in front of, behind, and next to. The take-home packets were easy to assemble and look fabulous when printed in black and white. Mrs. I. included a cover page and a parent letter. The activities for take-home include pirate sizing, treasure counting, treasure positions, where are the letters, treasure chest writing, and number memory. 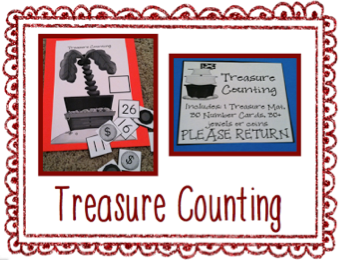 Here is an example of treasure counting. I think my favorite part of this fun-filled packet was the emergent reader text. As you can tell, my 4 year old son also enjoyed it. Even though he can not read yet, we ran to his bedroom to get his pirate hat and look through the pictures. Thank you for providing such a great product to review. If you would like to check out Mrs. I's other take-home packets, click here. I also want to thank our own... Stephany Dillon!! The fonts used in the text boxes above are from her Super Cute Font Pack!! I also want to thank Mr. Magician for the glittery borders! !